Community leaders locally, nationally and abroad are interested in learning and supporting stewardship motivations. Over the past year, Green Seattle has heard from some of the most active volunteers on what can make the stewardship experience with the Green Seattle Partnership the best it can be. In Summer 2015, Green Seattle Forest Stewards, Community members, and Committees answered online surveys about their role in stewardship. Out of about 140 active Forest Stewards that year, 48 submitted responses to the “Forest Steward Survey”. The survey asks how long they have been a steward, how they learned about the program, motivations and challenges, and opinions on Green Seattle and the future of stewardship. In the survey, most reported that a partner organization or Parks staff member led them to the program (48%). Almost 20% said they attended a work party as a new volunteer and then became more involved. For me, the question usually comes from new volunteers that show up at a work party, or from a colleague at a meeting or professional connection. People from all backgrounds are curious how this impressive group of citizens come together, and how they figure out all the complex needs a forest may require. Are stewards formally trained, or is there an application process? I usually answer with a pun: “It’s an organic process”. Since about 2013 (when I became a Steward), I’ve met nearly 150 Forest Stewards through trainings and events. What I have come to see among my peers is a wide range of knowledge and an undeniable passion and desire. 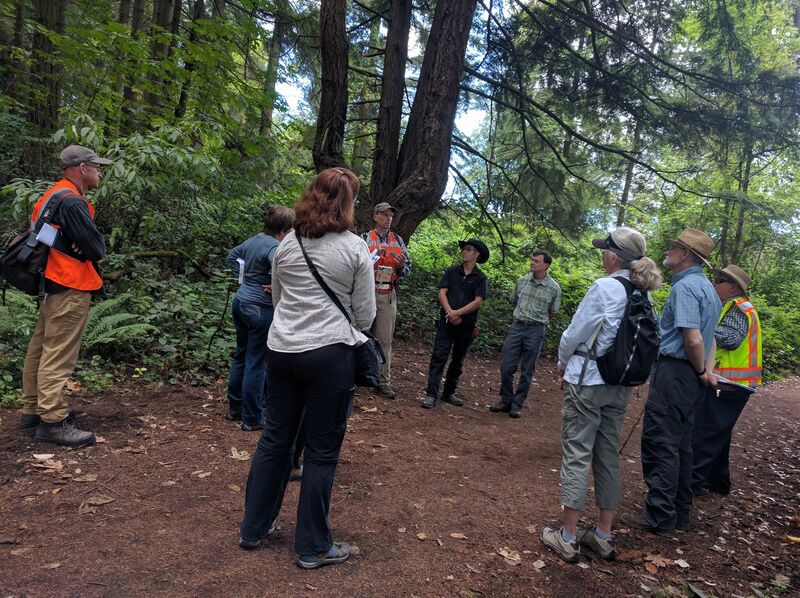 Most people who come to be “Forest Stewards” are frequent volunteers in a park near their house, and a Seattle Parks ecologist or fellow volunteer directs them to resources and connections found through the Green Seattle Partnership. Most Stewards are not new to the field. Most have had at least a year of hands-on work, and they are long time scholars or recent graduates in an ecological field. A handful of the newest Stewards have stepped in with a lot of interest but little experience. As a group, we are an impressive bunch. Stewards gather at an “invasive plant” training event in West Seattle. These opening survey questions hint at a larger question that cannot be answered in an informal survey. How are Green Seattle Forest Stewards situated within our city’s stewardship culture? Within the nation and world? Several recent publications situate Green Seattle within the stewardship movement, from the local to global. A Seattle-wide context is from a 2012 article produced through the Green Cities Research Alliance. A set of researchers conducted lengthy interviews with 9 leaders representing a range of not-for-profit organizations from small volunteer-based outfits to large land conservancies. The interviewees served in a leadership capacity but all had background and history in getting their hands dirty. Cognitive mapping results. Source: Romolini, Brinkley and Wolf 2012. Interviewees answered the question “What is environmental stewardship?” using note cards to brainstorm and write ideas, phrases, or terms (the article has a detailed overview of this cognitive mapping process). The interview participants conceptualized stewardship at two social scales, the individual level and the organizational level. Participants “generally described individual motivations for stewardship involvement as being more value-based. Specifically, values included environmental ethics, personal ethics, and concern for community (p.24).” The interviews revealed how individuals apply their stewardship values through direct behaviors, actions, and decisions. Bringing other people into stewardship was an important component. “When acting on values, outcomes such as environmental improvement and community building, in addition to personal benefits such as meaning or realization of passion, can be met. 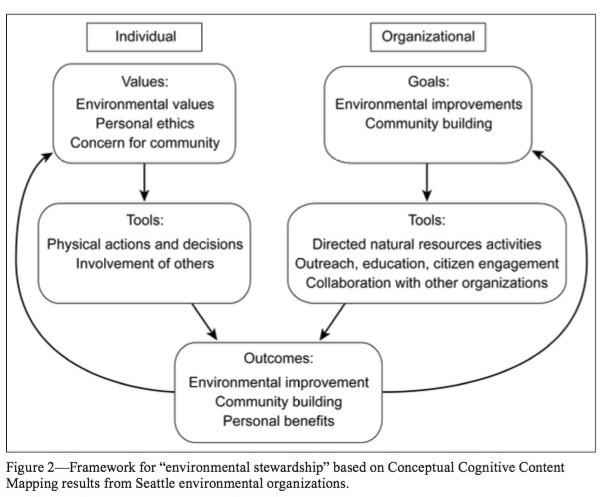 Positive outcomes can affirm, then strengthen initial motivations (p.24).” While the individual values motivating stewardship may not be surprising to those of us who undertake it, this publication provides evidence of the social dimension underlying and supporting environmental restoration goals. Jumping up in scale, how does contemporary stewardship exist nationally and globally? In the U.S., stewardship tends to exist within ‘green infrastructure initiatives’, themselves a component of urban renewal projects across cities and communities with broad social, economic, and environmental purposes. In the U.S., although programs are typically organized from the top-down, recent research suggests “digging in the dirt can be a viable way of getting people involved in the practice of democracy”. A strong collection of literature exists on the individual values and meanings within U.S. environmental stewardship. Globally, urban ‘greening’ projects typically address human impact on the land and need for access to nearby nature, sometimes focusing on resource use rather than public green space access. Some analogous programs to Green Seattle are organized bottom-up with an emphasis on direct local needs such as job training, food production or water conservation. Volunteer-based, ecological restoration is often not the main goal. For example, ‘green job’ programs in several African cities, western India, and British Columbia were developed as creative responses to political, social or infrastructure disenfranchisement. Such grassroots programs focus on serving low-income or disadvantaged populations. Stewards within these programs report broader motivations to undertake stewardship, often with direct personal goals such as job training or providing food for family members. At all these scales, it is apparent stewardship describes the ancient struggle to co-exist with the life forms around us. We have a long history of mistakes, but also of habitat healing. This weekend as you work in your garden or pull blackberry in a park, consider your role and motivations within stewardship, locally and globally.